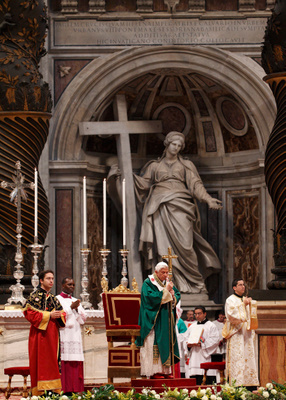 On Sunday Pope Benedict XVI celebrated the closing Mass of the Synod of Bishops for the Middle East. During his homily he announced the theme of the next Synod of Bishops, in 2012. That Synod will be focused on new Evangelization. I have decided to dedicate the next Ordinary General Assembly, in 2012, to the following theme: “Nova Evangelizatio ad christianam fidem tradendam - The new Evangelization for the transmission of the Christian faith. Adding that one of the themes brought up repeatedly during this Synod was not just the need for peace in the Middle East but the need for a new Evangelization, especially in places where Christianity has the deepest roots. This past June Pope Benedict announced the creation of a new Pontifical Council for New Evangelization and earlier this month he issued the "Motu Proprio" or official decree that formally established the new council. Although as of yet they have no office space or staff, other than the head of the council, Archbishop Renato Fisichella, they have a clear mandate for the next two years. Pope Benedict repeated his announcement about the theme for the next Synod during his Angelus address, adding that the Church is present and works everywhere to embrace all peoples and offer Christ, the fullness of life.